Dieser Eintrag wurde veröffentlicht in Regatta-Ergebnisse/Training von Silber Sands. Permanenter Link des Eintrags. The wind will stay once You moored or capsized. Talked to Dutch today and also tested by myself. 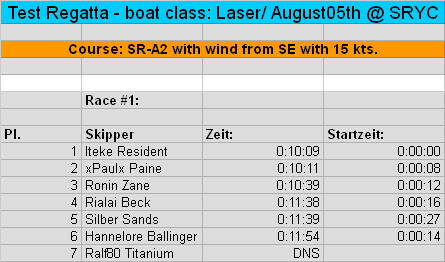 concerning Laser sailing… we’ll also have to set a version for regattas; half of fleet today was using the version where You can see all „sailing-numbers“, app.wind angle, sail angle etc. The other half used the tell-tale version where You can only sail by feeling and mini map. I dunno what Ralfo will plan.. should be same for all though. there is not this one sailor who wins all and everything. Sailors do share skills, do share what they know about boats and sailing. Go Iteke and xPaulx !!! !